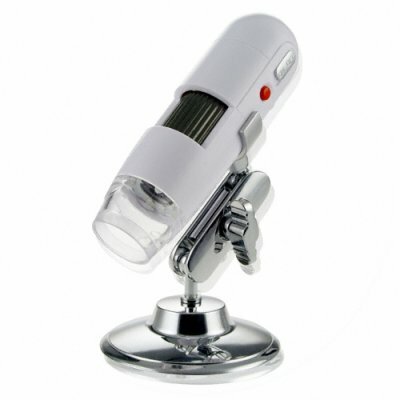 Successfully Added USB Digital Microscope With 1.3 M Pixel Resolution - Video Clips to your Shopping Cart. It is a perfect item for use in the classroom, close product inspection, or just for plain fun, and available directly from Chinavasion's convenient online store. Very useful for children at home, as long as it should to the lab to get a microscope. VERY HELPFUL SCHOOL LESSON. I use Photoshop and was easily able to import images from the USB digital microsope. The microscope is easy to setup and the acompanying software is easy to install. For me the fun starts within minutes of installation; I was able to see all kinds of things magnified 200 times and crystal clear in full color. The brightness of the in-built light can be adjusted so there is no glare on the object being inspected. Although there was a shutter button on the microscope itself, I found using the software to “click” a picture was easier as it prevented the microscope from being shaken. Esentially, this is a webcam to which a macro lense has been attached. Lense is protected by a lense cap. All in all, an excellent item. I wanted something to use to inspect jewellery without using a loupe and found this very good indeed. As stated by others, the colour and sharpness could be better, but this should all be considered with the price of the item, which is very fair. I wouldn't have expected more for the money. To get better quality, the investment in optics would be much higher indeed. I am satisfied. on 2008-05-05 23:49:54 Very nice gadget. The microscope has two focal points, one for the 27x lens and one for the 100x lens. This means you can blow up an area of either 6 by 4.5 mm or 2 by 1.5 mm to full screen, which is quite impressive. The image quality leaves room for improvement, but what would you expect for this price? Cons: Image quality is not that great, the color is often off and the sharpness could be a lot better. EXCELENTE PRODUCTO CUMPLIO MIS EXPECTATIVAS Y SOBRE TODO ES MUY VERSATIL Y TIENE MUCHAS APLICACIONES.